SPE is a full service electrical contracting company in Orange County with 30 years experience in Commercial, Residential, and Industrial problem solving and upgrading. Our experience enables us to provide our clients with a depth of knowledge in the most up-to-date electrical codes and safety measures. 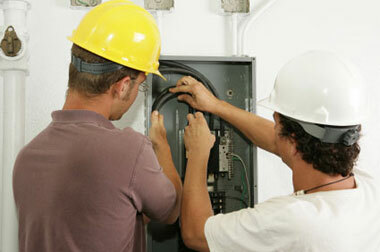 We provide quality electrical craftsmanship exemplifying the highest standards of the electrical profession. Our superior customer service, excellent communication and client education are the cornerstones of our business. Superior cleanliness and follow through are our standards. "From the Attic to the Crawl, We do it all!" “I called SPE because I couldn’t turn my can lights on and run my hair dryer at the same time. SPE promptly came out (on time!) and fixed the problem and educated me (for free!) on additional safety concerns within my home. They did such a great job I had them come to my office and upgrade my electrical panel to install my new copier. They were the BEST electricians I have ever used efficient, cost effective and very clean”. Our clients are home owners, business owners, commercial property owners, property managers, school districts, realtors, bank Reo’s, home warranty companies, professional and retail establishments, HVAC contractors, commercial contractors, tenant improvements, sign companies…and YOU. Servicing communities in and around Orange County including Fullerton, La Habra, Anaheim, Garden Grove, Santa Ana, Yorba Linda, Tustin, Whittier, Irvine, Costa Mesa, Orange County, Newport Beach, Laguna Beach, Newport Coast, Corona Del Mar, Laguna Niguel, Mission Viejo, Crystal Cove.